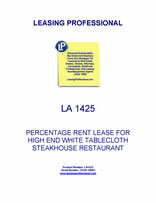 This Lease is made as of _________________, by and between COMMERCIAL PROPERTY LANDLORD, INC., a __________________ corporation ("Landlord"), and AGREEABLE RESTAURANT TENANT, INC., a _________________ corporation ("Tenant"). A. Project (Section 1.2): (the "Project"). C. Square Footage (Section 2.1): Approximately _________ square feet, subject to final measurement as herein provided. D. Term (Section 2.3): an initial partial Lease Year (if the Commencement Date does not occur on the first day of a Lease Year) and thereafter fifteen (15) full Lease Years, and if exercised, the option periods provided for herein. E. Option (Section 2.8): two five (5) year options. (b) ___________ in the event the Possession Date occurs subsequent to _____________. It is agreed that if the Possession Date has not occurred on or before ____________, then, and in only such event, provided the Tenant has not opened for business to the general public on or before _____________, the Commencement Date shall be delayed and extended by an additional one day for each day beyond _________ that the Possession Date occurred. G. Expiration Date (Section 2.3): last day of the fifteenth (15th) full Lease Year of the Term, unless extended pursuant to the option described in Section E of these Basic Lease Provisions. H. Possession Date (Section 3.4): see Section 3.4 and Exhibit D, Section 1.02(c) hereof. I. Permitted Use (Section 2.5): A high end, white table cloth style steakhouse restaurant and food service which (subject to obtaining appropriate permits and licenses) may serve liquor for consumption on the Premises, and including the following ancillary uses: (a) live entertainment on a limited basis, such as jazz combo in the bar area of the Premises, or musicians hired for private parties held at the Premises; and (b) incidental thereto, office, storage and other ancillary uses. The Tenant's menu will be similar to menus for ____________. Initially, Tenant agrees to open for business under the trade name of specified below in subsection (L). For purposes of this Section, "Effective Rent" shall mean the sum of the Base Rent and Percentage Rent paid or payable during any Lease Year, provided that the percentage rent offset provisions of section 4.5(b) hereof shall not be used for purposes of calculating the base rent during the option periods pursuant to this section J. OPTION 2 (21st Lease Year through 25th Lease Year): Annual Base Rent shall be equal to 85% of the average Effective Rent during the last three (3) Lease Years of Option 1 (i.e., the 18th Lease Year through 20th Lease Year of the Term); provided, however, in no event shall the annual Base Rent for Option 2 be less than the greater of the Effective Rent during the 20th Lease Year (if Percentage Rent was payable for the 20th Lease Year), or the Base Rent payable for the 20th Lease Year (if no Percentage Rent was payable for the 20th Lease Year of the Term). Landlord and Tenant acknowledge that the actual amount of Base Rent payable during the option periods will be computed on an Effective Rent basis and, therefore, may not be determinable until the submittal of Tenant's annual Gross Sales statement (due ninety (90) days after the expiration of each Lease Year). Accordingly, Landlord and Tenant agree that, until the determination of Tenant's actual Gross Sales (and the Percentage Rent due Landlord, if any) for the Applicable Lease Year can be made, Tenant shall be permitted to continue to pay to Landlord the Monthly Base Rent paid by Tenant during the final Lease Year of the Term which has just expired. At such time as the Base Rent for the applicable Option can be determined, Landlord shall invoice Tenant for the new amount of Monthly Base Rent due for the then current option period based on the formulas set forth above, together with the amount of any deficiency in Tenant's Monthly Base Rent payments which has accrued to the date of such invoicing. Within ten (10) days after receipt of Landlord's invoice, Tenant shall pay Landlord any deficiency in Base Rent. From and after the date of Landlord's invoice, Monthly Base Rent shall be adjusted to the amount set forth in the invoice, provided, however, in no event shall the Base Rent be less than the amounts set forth above. In the event Tenant believes that Landlord's calculations of the annual Base Rent for either of the Option Periods is incorrect, Tenant shall, within thirty days after receipt of the invoice described in the preceding paragraph, provide Landlord with a written statement enumerating in reasonable detail the reasons for Tenant's objections to such calculations; provided, that if within thirty (30) days after Landlord's receipt of Tenant's aforesaid written statement, Landlord and Tenant are unable to resolve Tenant's objections, then, unless otherwise mutually agreed, any such dispute shall be resolved by binding arbitration in the jurisdiction in which the Premises are located in accordance with the then Commercial Rules of the American Arbitration Association, and the respective costs of such arbitration incurred by each party with respect to such arbitration shall be borne by each such party in equal shares, provided each party shall be responsible to pay its own legal fees and costs for such arbitration. Commencement Date to the expiration of the first (1st) full Lease Year, 6% of annual Gross Sales exceeding a Breakpoint of $__________ per annum. Next four (4) full Lease Years, 6% of annual Gross Sales exceeding a Breakpoint of $__________ per annum. Next five (5) full Lease Years, 6% of annual Gross Sales exceeding a Breakpoint of $__________ per annum. The annual Breakpoint at which Tenant shall be obligated to commence the payment of Percentage Rent during the Option Periods shall be adjusted by dividing the annual Base Rent payable during the applicable Option Period by six percent (6%). L. Trade Name (Section 8.1): Initially as ______________________ . T. Annual Advertising Fee (Section 14.1): None. U. Radius Restriction (Section 8.5): _____ (___) miles from any exterior boundary of the Project.